Unorthodox Racing Pulley Sets are available in a number of configurations. Our pulley sets provide most of the power gains through weight loss (80-85%). The remaining part of the gains from these pulleys comes from underdriving of all the accessories (15-20%). However, we do not push underdriving for two main reasons. First, it is important to keep charging systems, air conditioning, power steering, and water pumps moving fast enough for every day driving. Second, not much horsepower is gained from extreme underdriving. In most applications all of our underdriving is done with the crank pulley, not the accessory pulleys. This is done so maximum weight loss can be achieved at the crank where most of the horsepower gains are found. As with our stock diameter crank pulleys many of our customers have also asked for stock diameter pulley sets that do not underdrive their alternators, power steering pumps, superchargers and water pumps. Because of these requests we developed our stock diameter pulley sets. Many customers want the performance benefits of weight reduction without any sacrifices, especially audio enthusiasts as some audio competitions require voltage to remain at a specific level. With our stock diameter pulley sets the alternator and other accessories spin at stock speeds with NO underdrive. This is also important for stock or aftermarket supercharger systems. 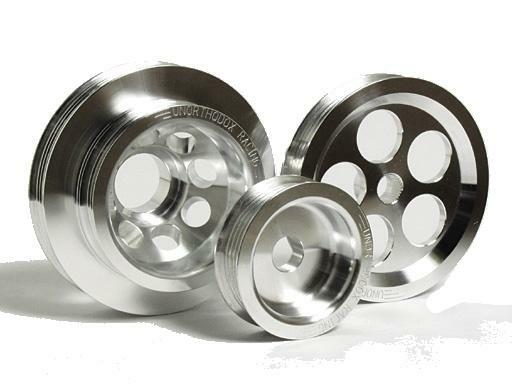 These systems are either driven off the alternator, air conditioning or power steering sections of the crank pulley and now you can use our stock diameter pulley sets with these supercharger systems and have the same boost you had with the factory crank pulley.st level with the use of the factory diameter crank pulley. 100% of the power gains from the stock pulley sets comes only from weight reduction versus the factory crank pulley. The reduced weight allows for more power transfer to the drive wheels. A little slow at the server to place the order. It was extremely quick and easy to order. Excellent job guys and gals. It just doesn't get easier than this! placed order, received confirmation email, received shipping email, was able to track shipment and received product on my doorstep well packaged and in mint condition. very quick turnaround :) like i said, it just doesn't get any easier than this! Cheapest parts anywhere! Fast and reasonable shipping. Great products - never any issues! Autoplicity is Awesome!!!!! I ordered a Aeromotive Stealth 340hp fuel pump for my 89 Supra Turbo. Not only did they have the best price on the part I ordered, the shipping was the fastest I've seen in a long time from any company. I ordered it on Wednesday, had it shipped to a freinds house where my car is and the part was there Friday morning. I was like DAMN!!!! That was fast I wasn't expecting it till Saturday or even Monday. Luckly my friend was off work that day so he could sign for it. With service like that I will definitely order from them again, even if the part cost a little more, cause I know I will get it ASAP!!!! On top of getting the awesome price, shipping, and customer service, now they are offering another $5.00 off my order. The only thing that could have been better is if they offer Military Discount which I forgot to ask about. Well kids the moral of the story is, that if you don't order from Autoplicity you are just plain DUMB!!!!! !